It was not a quiet route, the path past the high tower wherein lived a young lady who had never seen the world. On the contrary, it was described by Tennyson, in his poem telling her tale, as a veritable highway. The Lady Of Shallot watched the reflections of the shiftless currents of a restless river. She used to track the yokels as they meandered with questionable intent towards Camelot. And with a daughter of almost 12, my heart swells for her as I hear how she loved to watch the market girls in their red cloaks, going about a daily routine, a vivid part of the common world she was never destined to join. Groups of giggling girls, pairs of knights, funerary processions, solitary clergyman: all human life walked along that road to Camelot. And she saw it all from far above, almost with a birds eye view, detached. She could see the schemes of things: too bad she could never be part of them. When I hear of her plight I am always torn. Because I grieve for a fresh young soul who would never know the warmth of human companionship. But part of me yearns for the whole picture that tower would bring. You have to be a little detached to see the whole picture. The French Aerostatic Corps knew that, when they launched the first observation balloon in the dying days of the 18th century. Those prototypes were to presage a long history of sending people away from the action, up high in the air, to view the effectiveness of their actions and the tactics of the opposition. They were used in the American Civil War, the second Boer War, the First World War and even the Cold War.There were even military daredevils trained to shoot them down and collect their pelts. A vantage point like that: it was a valuable source of wisdom. But sometimes, being high isn’t about gaining advantage, but about gaining perspective. Phil, Maddie, Felix and I have been in London all day, scurrying about with a packed agenda. This morning we headed for the Tower – we’ve never seen the Crown Jewels- and this afternoon was devoted to the London Transport Museum. By five we were tired and headed for a favourite hotel: a very tall one indeed. Tennyson’s Lady would love it. 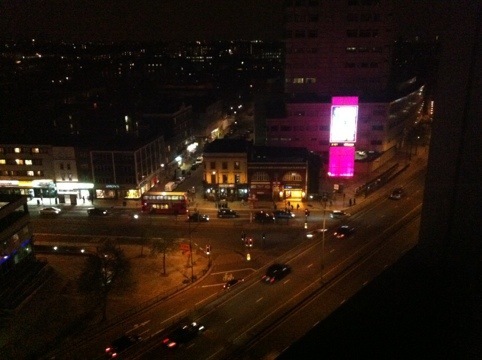 We are on the eleventh floor, overlooking the WestWay, one of the main roads out of town towards the West. It is not a salubrious, manicured part of town. It has its yokels and its market girls, it’s clergymen and its knights. The London buses come and go in a ceaseless cycle and police cars wail out of the high profile police station opposite, now and then. But it has its magic. I sit here for all the world like The Lady, without a mirror: hunched delightedly at the huge picture window on this eleventh floor. The very ordinariness of the neon shop signs becomes magical up here above the noise and din of late-night life. The streets are still busy and the tube station never sleeps. The car lights twinkle and I remark tiny details of the scene before me: a nocturnal child dangling their legs from the bus-stop seats; the ever-lit offices of the police station; the way the traffic bunches and disperses. All human life is there. The city will quiet, but it will not sleep. And here I sit, completely uninvolved, watching a scene as intricate as life itself -but idealised. I know I will have to come down: there’s no Lancelot for me, but a full life just eleven floors away. But I don’t have to come down just yet. A few more precious hours. Posted in UncategorizedTagged Lady of Shalott, Tennyson, vantage pointBookmark the permalink. That magic time out of life, a secret. Watching unobserved (or so we believe). 🙂 It’s a lovely moment, Sidey. Ah yes, it is lovely to look from above – from a tall building or a plane – to watch the world in miniature. Felix has been crouched by the picture window at every opportunity, Gabrielle. Fascinating view. tall towers bring on vertigo but strangly not hot air balloons! no sense in the world of us:) when I floated across the country side day after day, I loved the business of the fields and woods below. Life never seen even on foot, let alone in a car. few people unlike London, but more than one imagined, working in the open, tucked into hedgerows, peeping up from ditches. Wildlife, taken unexpectedly at our silent approach. Whenever I ‘see’ empty countryside I can people it, a whole new world that I have knowledge of. That sounds delightful. I keep dropping hints that I would like a balloon ride for my birthday – I wonder if anyone is listening? We flew/floated in a hot air balloon over Palm Springs, California. Wonderful fun, but hotter and noisier than I expected. And it tipped over when we landed . . . causing us all to tumble out and about. A large part of me still envies her, Alberta…a hot air balloon, the ultimate in unautomated perspective! You make me want to book a flight immediately! Take it from me the most glorious experience ever, peaceful, surreal,mind enhancing, exciting- oh the words go on – fantastic unless, of course, one crashes! :( I loved every minute even the running around in fields miles from base. Book a flight now. I have done as you suggest and casually shown H all of these comments – watch this space. I loved visiting The Tower, you could almost smell the history. What a great view from your hotel window and you got a wonderful perspective. Great piece Kate! Thanks Helen 🙂 I have a season ticket so I’m going to choose a quiet day next -if such a thing exists…. After the years I’ve spent in France, it looks like another planet. Oddly enough, I lived for many years in the Old Marylebone Rd, a biscuit’s toss from from the site of the hotel overlooking the Westway. Roger, you have a finger in so many pies….I’d love to have a London pad…. Wonderful post, the Lady of Shallot being your other worldly twin, looking at life from on high. Not so much the height as it is the perspective, like artists who must choose between living life or creating art about life. Happy to see elsewhere this a.m. that your Mom is doing better. Keeping you all in mind. Thanks Karen :-)Height does indeed blur the edges….but you get to see more! I discovered for the first time that double deckers have a huge number on op of them, which is for helicopters and things to read.I had no idea. Distance may lend enchantment, but also remoteness indeed. It is always a treat to sit and watch the world go by, to wonder what stories hover over the heads of each person who passes. I hope you are having another good London day or visit with your Mom and Dad. And you know better than most, Andra, he power of the stories over peoples’ heads. Thanks – had a good day with Mum yesterday, back in to Hammersmith this morning. What a lovely treat! A night away in a tower!! I recall waking up in Florence after arriving in the dark of night on a bus down from Venice via Padua and Bologna, looking out the hotel window and seeing the sea of sloping red tile roofs, and having that same feeling of detached awe and distanced perspective, experiencing the same city on street level was completely different. Now I bet that was a magical moment, Cameron: fairytale, almost, to look over the Italian rooftops. The Italians do views with such consummate style, don’t they? Tall towers always make me think of Rapunzel. Enjoy the view . . . and scenes from on high. A business conference pulled me off my quiet island and plunked me on the 21st floor of a hotel in Surrey – just outside of Vancouver. In the middle of the night, eager for a breath of fresh air, I went to the window and pulled open the drapes. Below me were 6 lanes of traffic – 3 each way – with constant traffic. The stream, the roar, the sirens did not diminish in the hour I was up. I wondered what on earth we have done to ourselves that we have to be on the go 24 hours a day. As fast and furious as the cars drove in one direction, an equal number moved in the opposite lanes. Perhaps the Lady would have benefitted from a mass of traffic…Lancelot could have slipped by unnoticed. Good point, Amy. Six lanes is a lot: and I had that many below my window. I suppose it’s part of my landscape and I never think twice about its being there. Hurrah! That’s a promise I cannot hear too often~! I must try hat restaurant, Celi! Oh, how lovely; to be perched up just high enough not to be seen and not so high as to not be able to see what is happening below. It sounds like a perfect place to rest after a busy day. Enjoy. It’s nice seeing little pockets of London like this, glad you had a great time up in town. I’ve worked on several height floors across some bits of it, St Paul’s always looks magical too ! It does, doesn’t it! The most beautiful form on the London skyline….